Just got back from picking up garbage in town. Helping beautifying and getting it ready for the big centennial coming up in July. It was fun spending time as a family and helping out the community. We sure picked our share of cigarette butts and bottle caps. Today I manage to do some more drawings of my character Lily. I've been working on her for a while now. Hope to be able to paint the drawings and post them up soon. Feel so great that I did so much today. 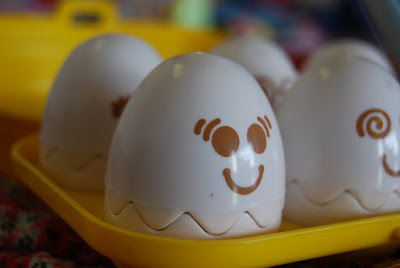 This picture of Lucius' toy egg basically sums it up! !